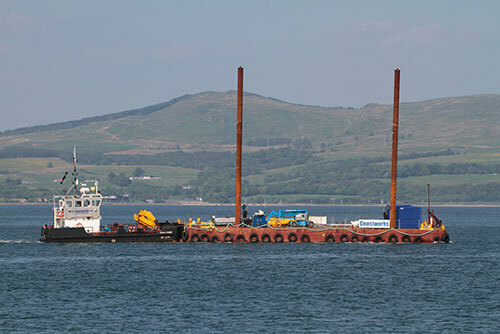 With reference to NTM 54/17, mariners are advised that contractors Raynesway Construction Ltd will have ‘MV Challenger of Leith’ workboat onsite with a spud leg barge and excavator to dredge the front of the temporary Colintraive slipway. Weather permitting works will commence on Tuesday 07 November 2017 and are scheduled to be completed within 7 days. During this time the contractor’s supervisor and Master of the vessel will liaise with the CalMac Harbour Manager and ferry Masters and will monitor VHF channels 12 and 16. Mariners navigating near to Colintraive Ferry Terminal are advised to maintain a look-out for the workboat and barge, maintain a safe distance and pass at minimum speed to reduce vessel wash.